Holiday trading can present unique challenges. Markets can be slow when you expect them to be fast and vice-versa. The collection of tips below are designed to help your trading, whether you prefer futures, stocks, currencies, or other instruments. 1. 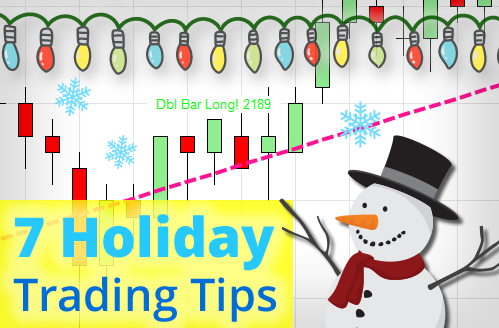 Big traders and their trading firms often take breaks and vacations during the holidays. The remaining volume is the result of smaller traders who are normally overshadowed. They trade differently than the bigger guys. As such, the market can move differently than normal. Keep your DOM window nearby in case you need to close out a trade early. Nov. 24, 2016: Thanksgiving Day, early close at 1 p.m. and market opens again at 6 p.m.
Nov. 25, 2016: Black Friday, early close at 1:15 p.m.
Dec. 26, 2016: Christmas Day Observed, closed and opens at 6 p.m.
Jan. 2, 2017: New Year’s Day Observed, closed and opens at 6 p.m.
Christmas and New Year’s Day occur over the weekend, so the observation day is the closest Monday. 3. When the Federal Open Market Committee meets, expect choppy holiday trading conditions. December 13 and 14 are the next dates to watch out for. Afterwards, late January 2017 is when they meet again. Check out this trading news calendar as well. 4. Consider basing your profit targets and stop losses on the ATR (Average True Range). Use a period value of four. John Paul uses it to manage risk and trade only what he believes the market can produce at a given moment. When the ATR is below one point, stay out. When above five points, stay out. 5. At the end of the year, traders pull out of large positions. When they do, the market can experience ripple effects, whereby traders get a rush of volatility followed by slow chop. At the first sign of volatility, play it safe for a bit and wait for the ATR to return to normal levels. 6. Most of the time, market prices tend to climb at the end of the year. If you are in a long-term short/sell, be careful. If January 2017 fits the Super Year pattern, any short trade may be problematic. When reviewing monthly performance, remember that you probably took fewer trades. Account for this with your budgeting/spending. 7. Successful traders should be calm and focused. For many, a great way to unwind is to spend time with family – especially during the holidays. Take time to share each other’s company. May you have a great holiday trading and a joyous holiday season! Hey JP I heard you say a while back that the end of the year is hit or miss for traders. Do you still recommend not trading around Christmas or has that changed? When is your next webinar, i missed the last one.